Broken Chair And Abandoned Red Brick Building. Slider Dolly Shot. Alpha Channel: No; Looped Video: No; Frame Rate: 24; Resolution: 1920x1080; Video Encoding: Photo JPEG; File Size: 381mb; Number of Clips: 1; Total Clip(s) Length: 0:13. Coffee; Green Grass And Village; Wooden Fence And Village; Cat In Country House; Cat; Country Cat; Firebug Bug. 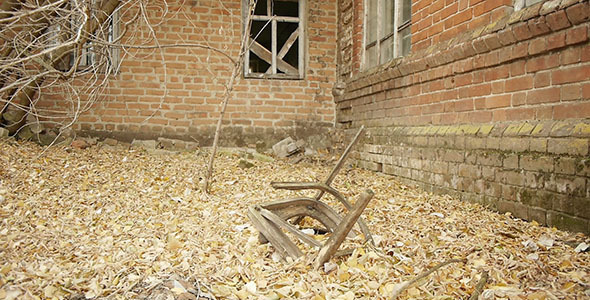 Keywords: abandoned, autumn, broken, building, country, countryside, dry, house, leaves, ruins, tree, village, yellow.